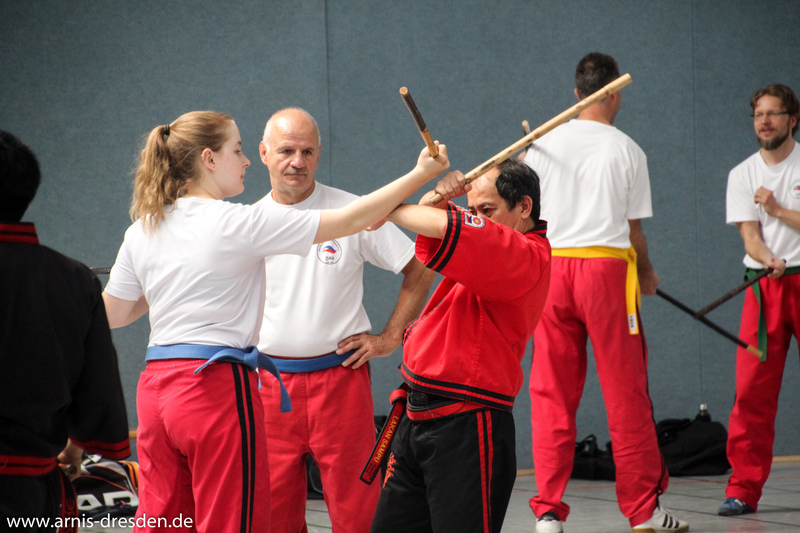 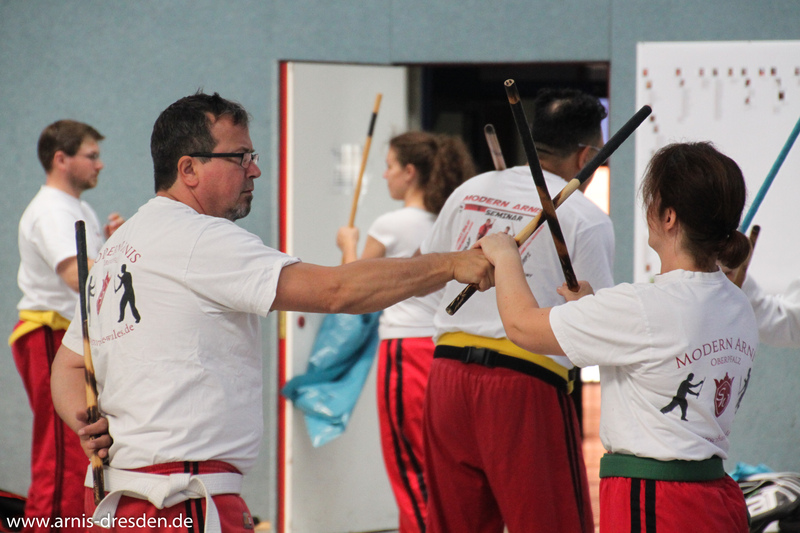 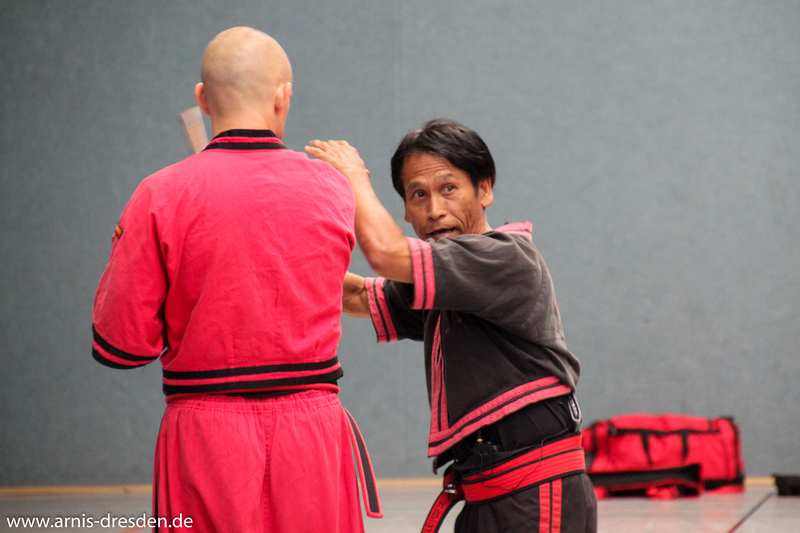 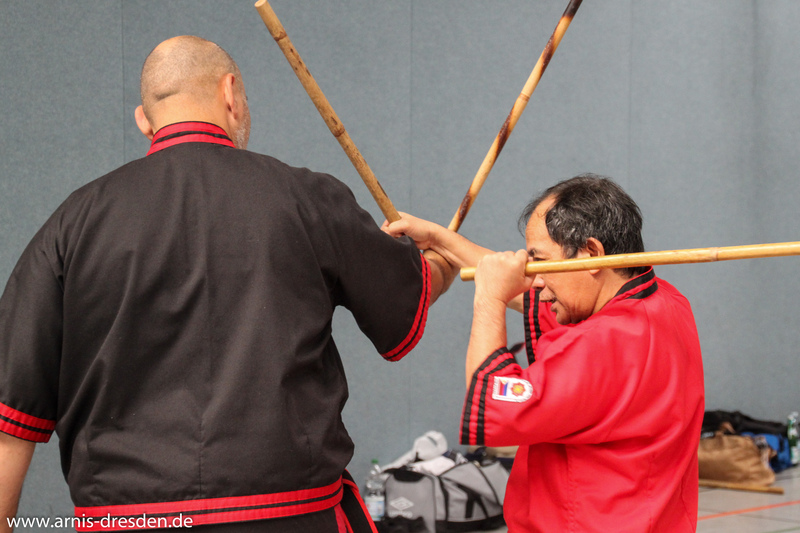 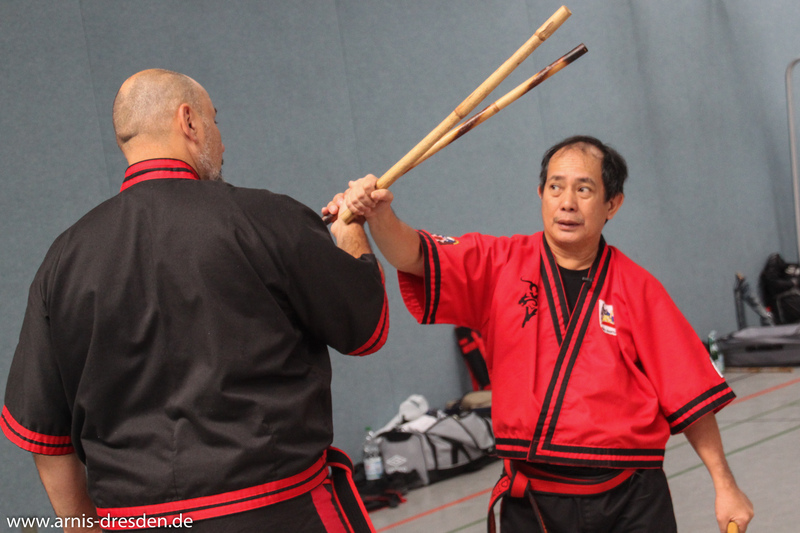 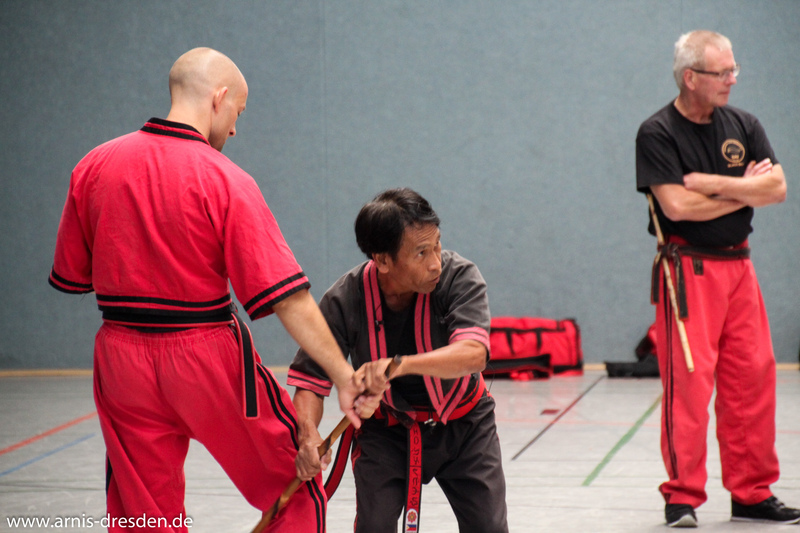 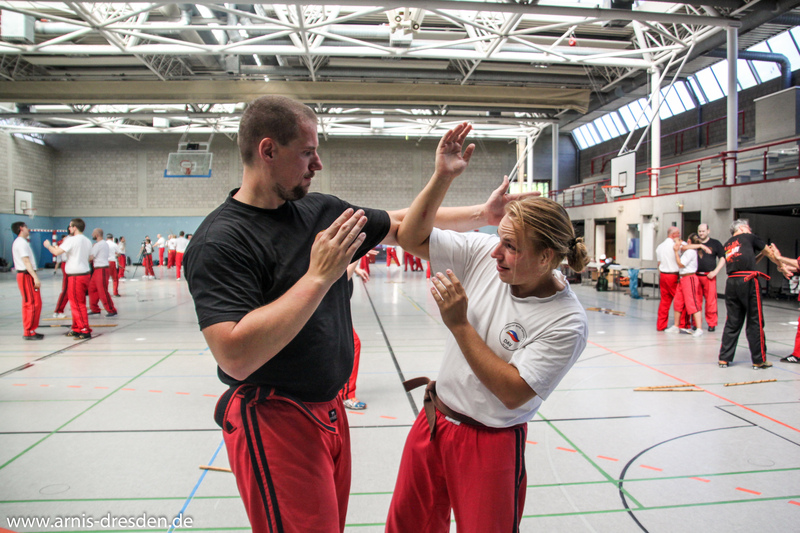 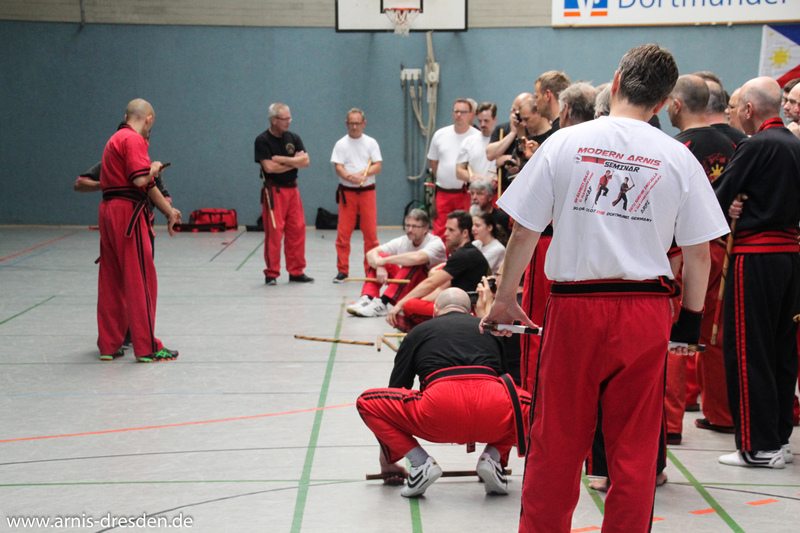 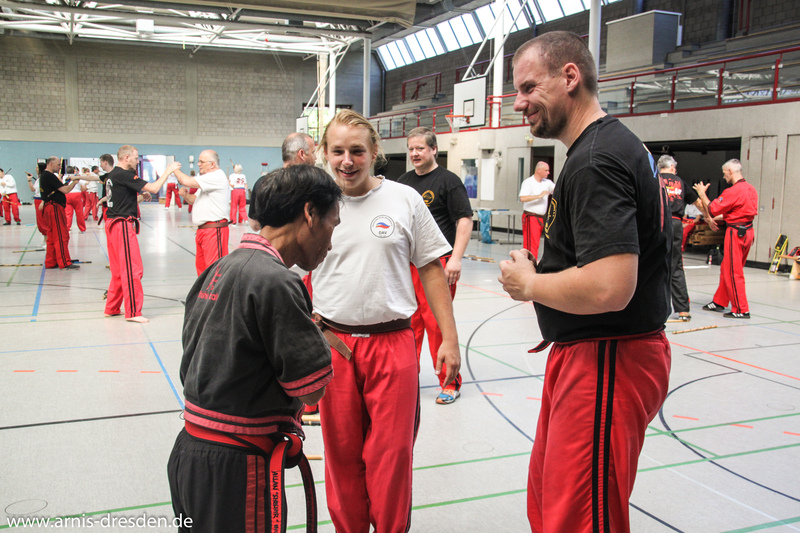 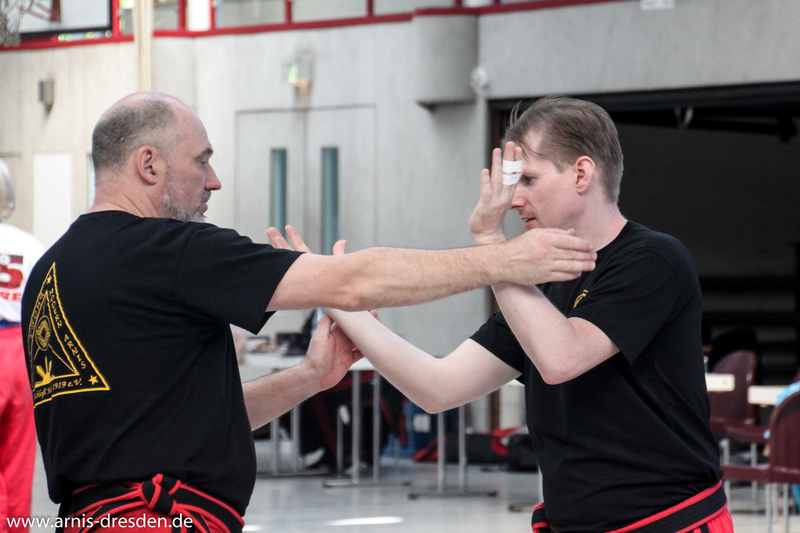 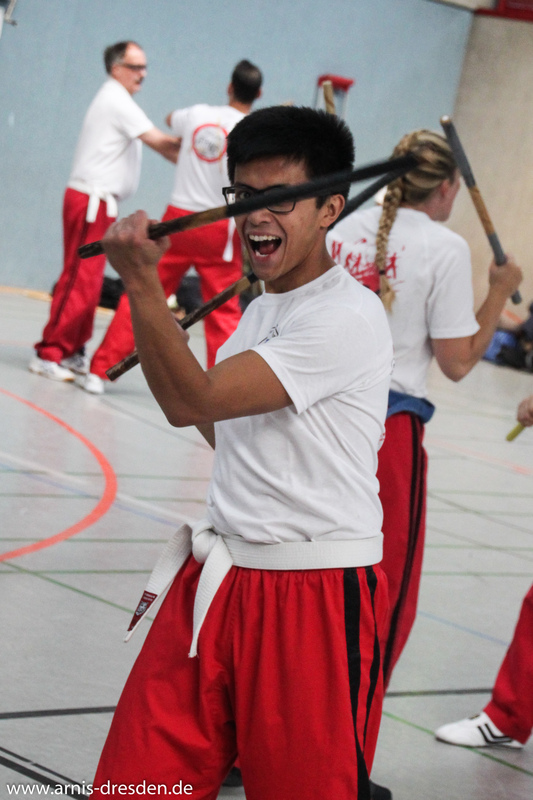 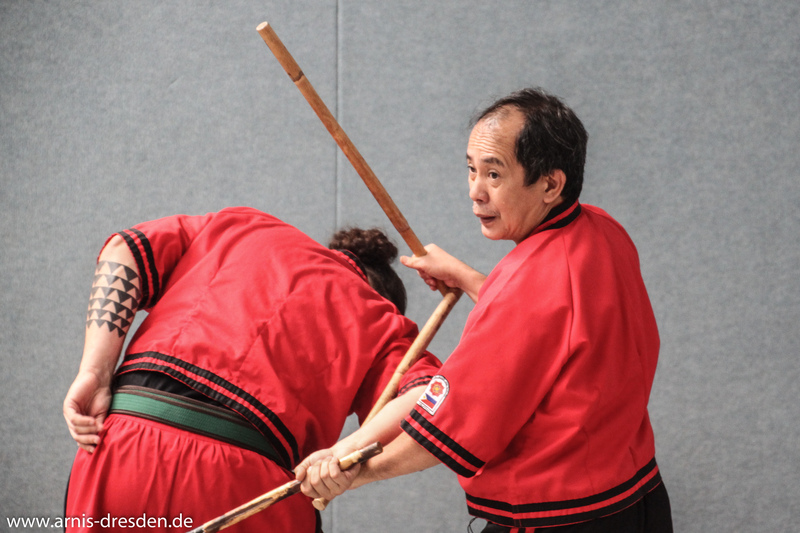 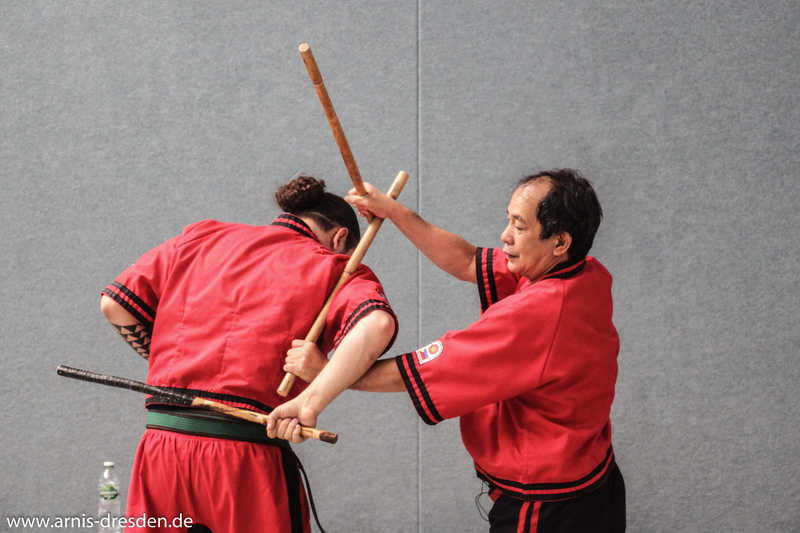 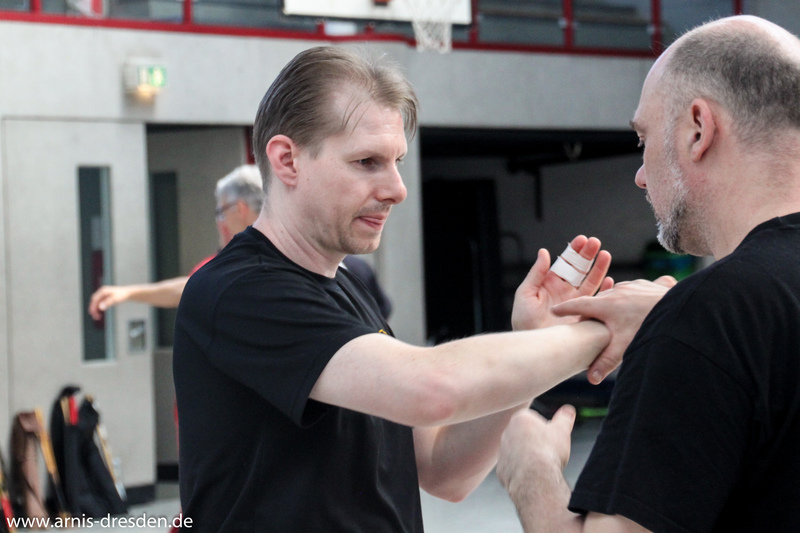 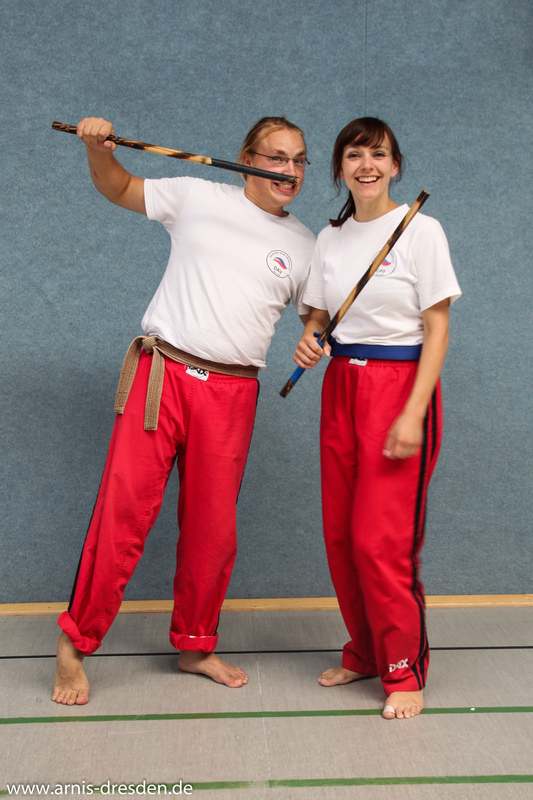 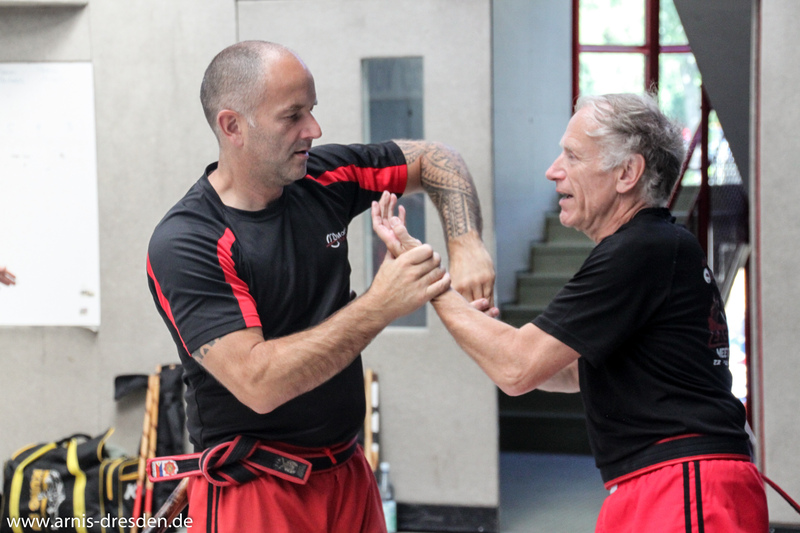 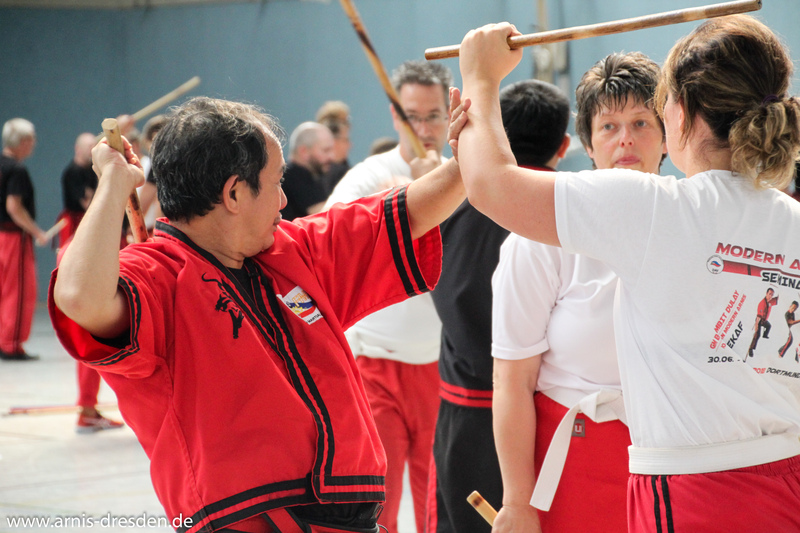 Grand Master Seminar in Dortmund – Arnis Dresden e.V. 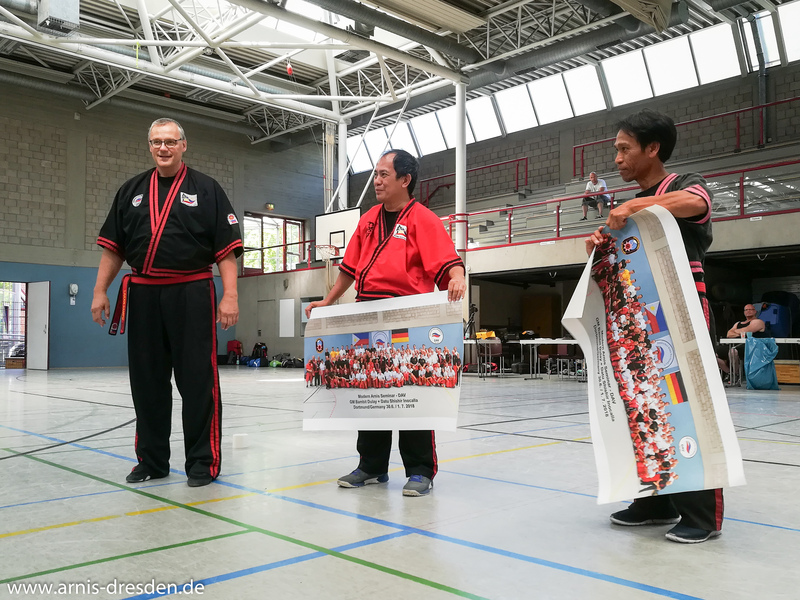 „Be like water.“ Three words that will stick with you for some time after a great seminar weekend in Dortmund with Datu Shishir Inocalla and Grand Master Samuel „Bambit“ Dulay. 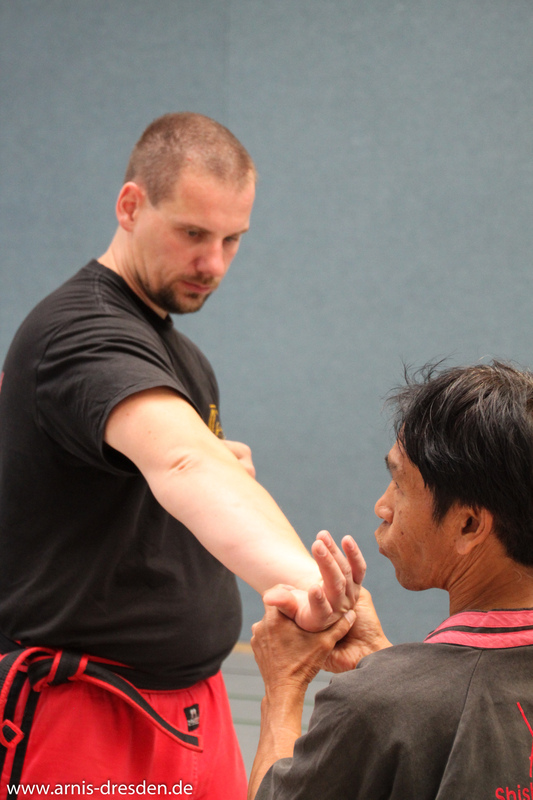 A total of 130 participants from nine countries (including the Philippines, Canada, Italy not only trained the principles of Modern Arnis under the guidance of the two philippine grand masters, but also took this opportunity to internalize the „spirit“ and the diversity of the art. 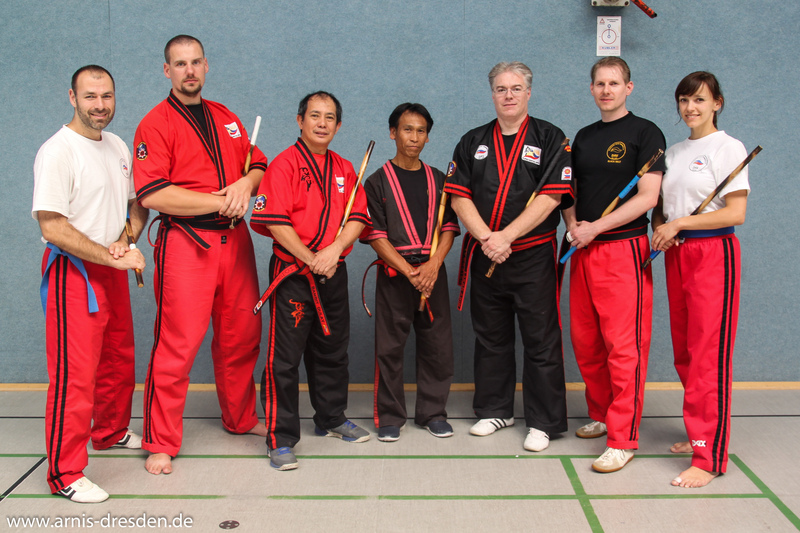 The five of us set out for Dortmund on Friday, full of anticipation for the seminar. 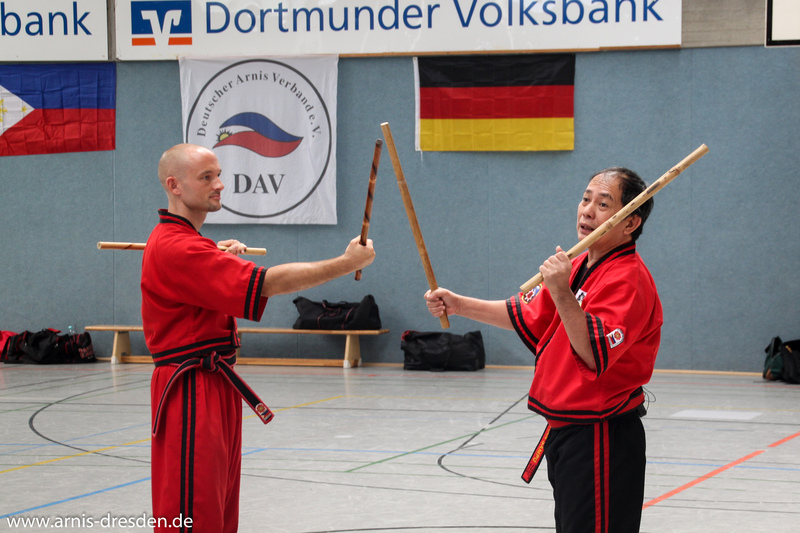 When we arrived there in the evening, some of the Arnisadores had already successfully completed the first part of the DAV event – their DAN exam. 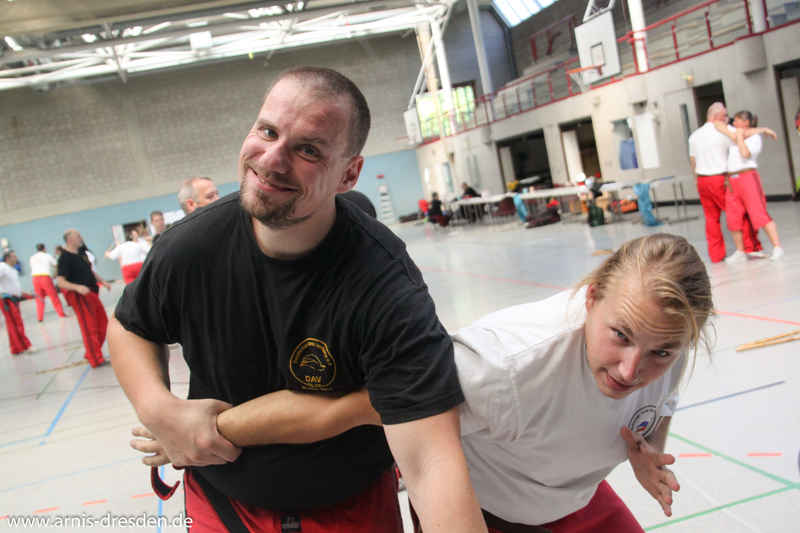 After the long drive we enjoyed a nice barbecue together with friends and called it a day. 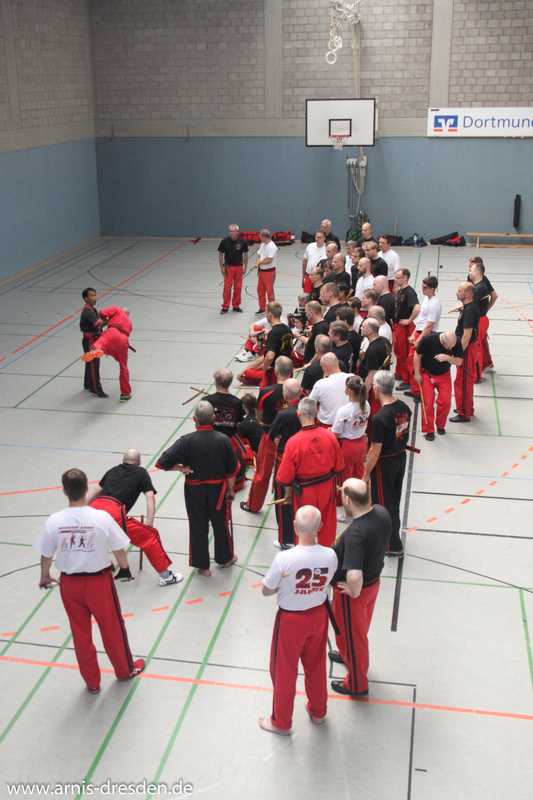 The majority of the participants arrived at the hall on saturday morning. 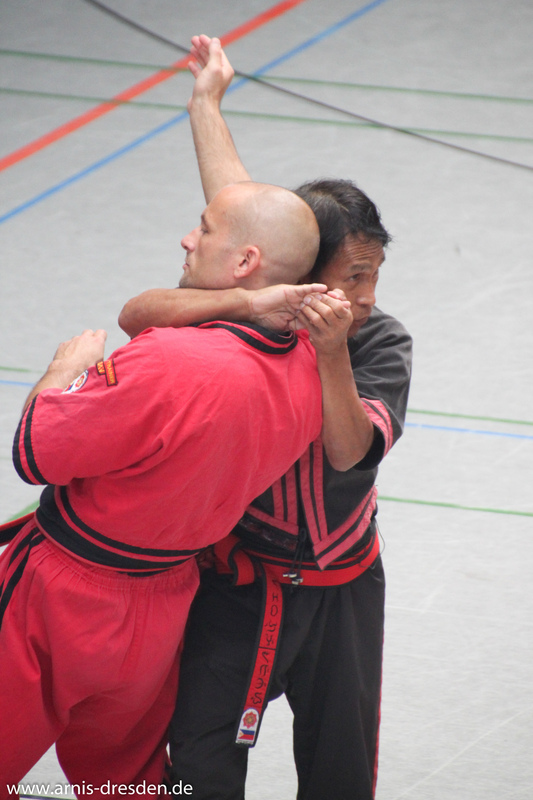 Not an easy thing to do, given the hugh rush of approximately 100,000 Pokémon-Go players around the hall going on the hunt at the very same time. 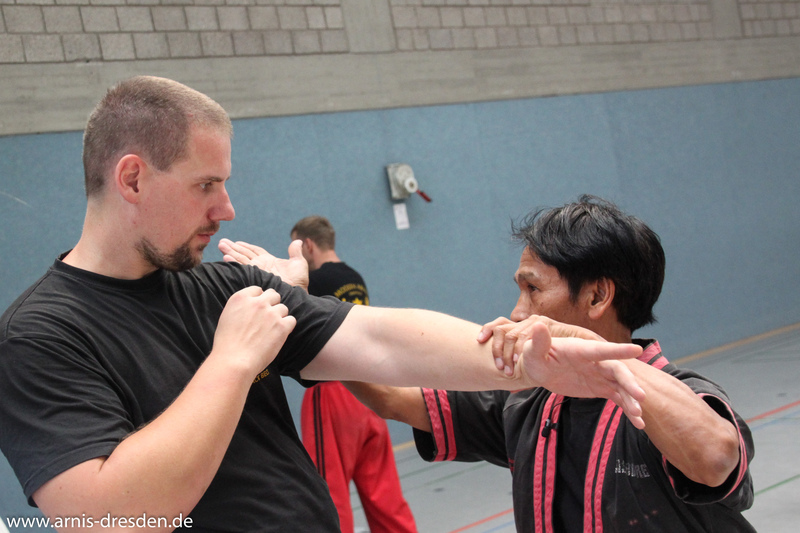 After Datu Dieter Knüttel and Master Sven Barchfeld officially welcomed everybody and graduated the candidates, the first two joint units started and made us sweat even more on this already hot summer day. 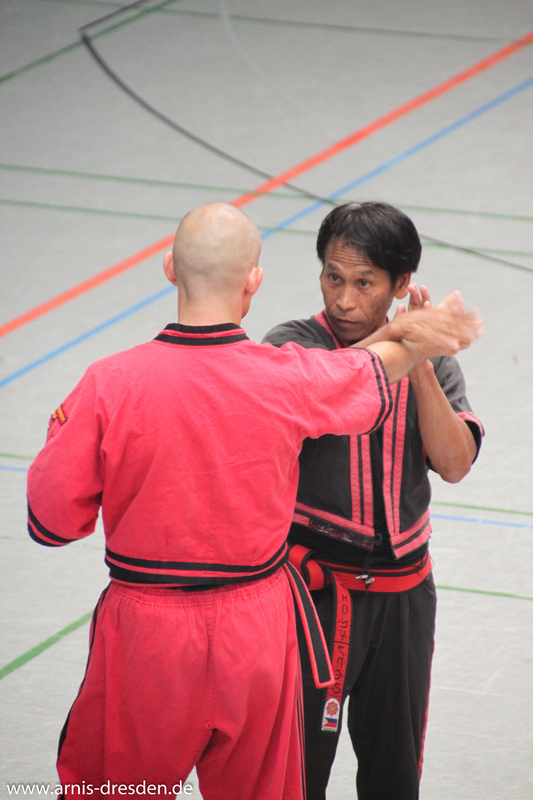 For the rest of the day and sunday, two groups were formed and alternately taught by Datu Shishir and GM Bambit. 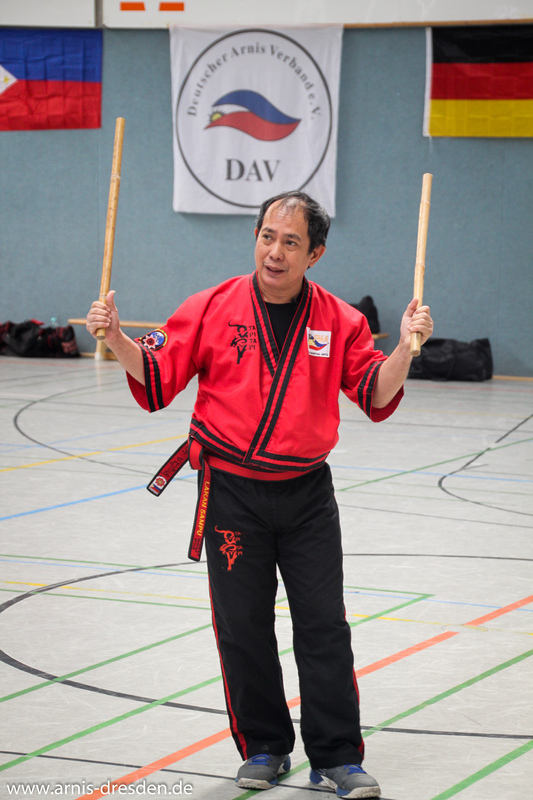 GM Bambit showed us a lot of drills (Abanico, Sunkete, Sumbrada), single drill with thrusts and butts as entry into doublestick Tapi-Tapi including advanced doublestick techniques, disarmings, clippings and hookings. 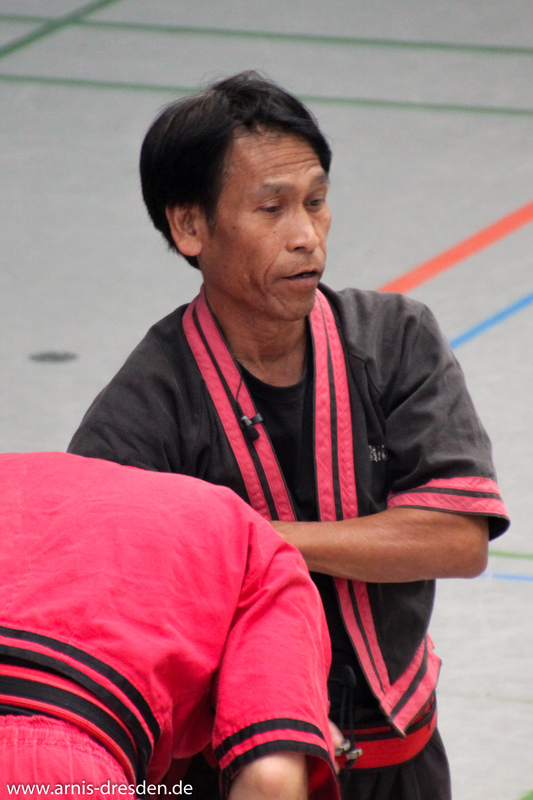 Datu Shishir, who impressed with tremendous flexibility at the age of 63, put special emphasis on the „flow“, the confluence of techniques and movements in all distances from stick distance to ground combat. 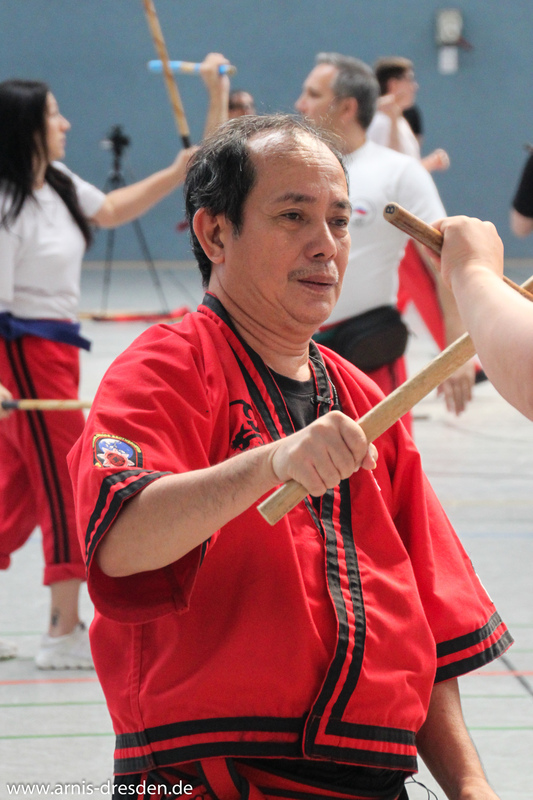 The former „Michelangelo“ (from the movie Ninja Turtles 3) also showed us how to apply stick techniques to empty-hand and knife, based on the numbering introduced by Prof. Presas. 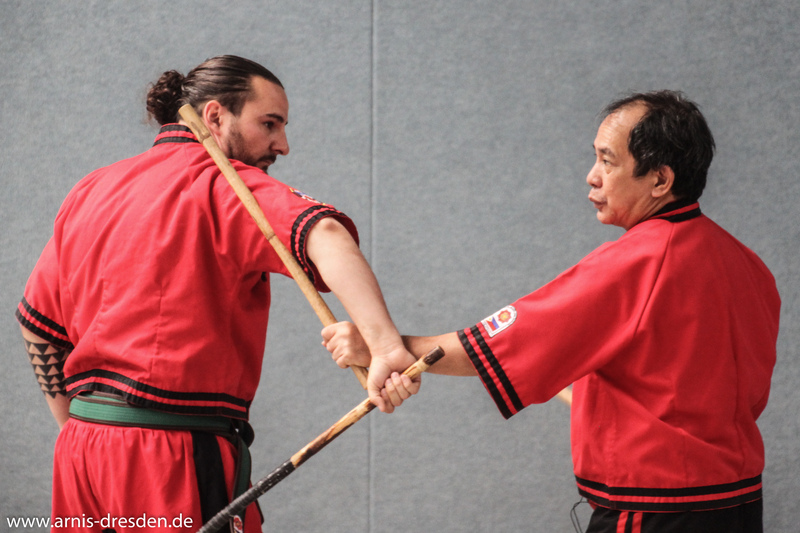 In his units he particularly mentioned that the acquisition of martial arts should go hand in hand with the expansion of the mind and the finding one’s inner center, e.g. 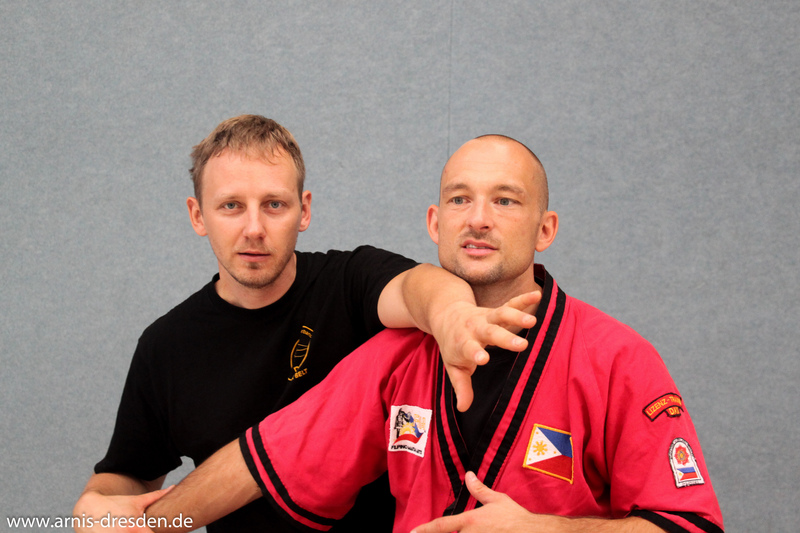 by meditation and yoga. 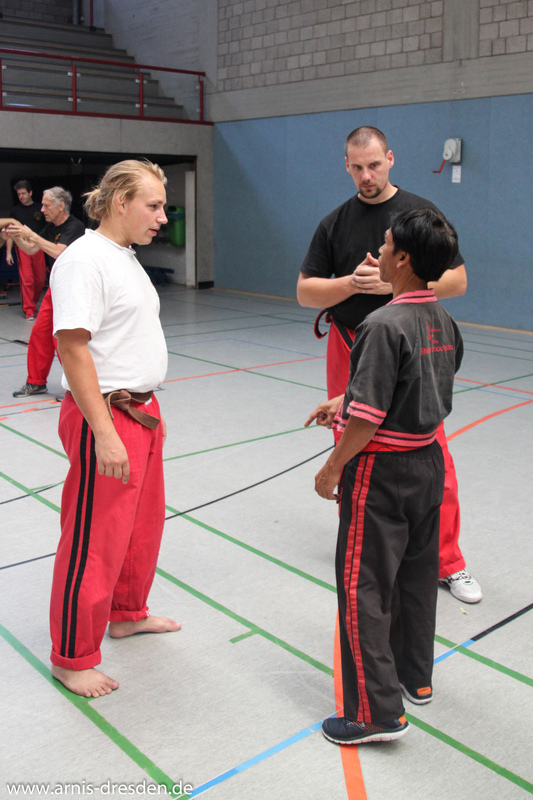 With his warm and calm manner, he conveyed the spirit of the „peaceful warrior“. 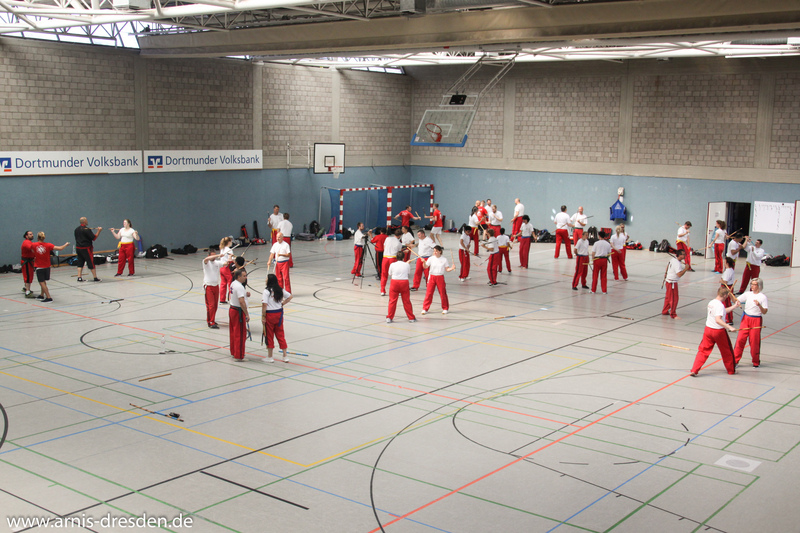 Sunday afternoon came about too fast and we went home tired yet very happy and motivated. 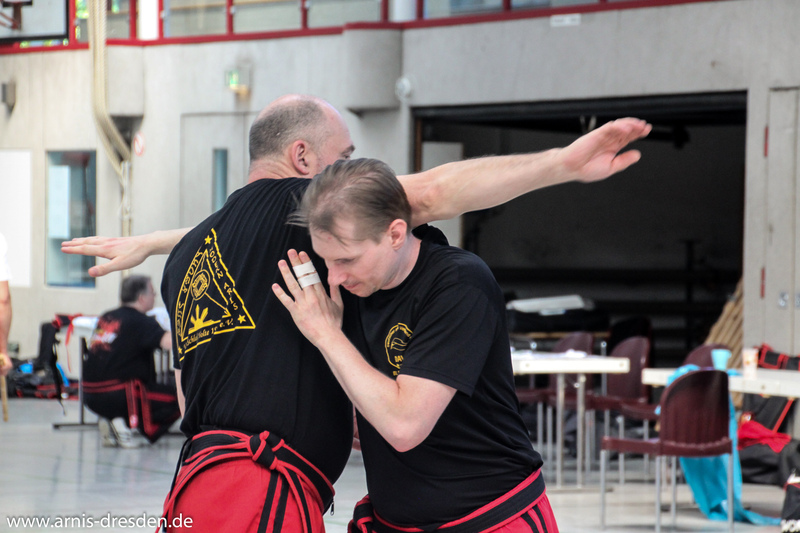 The Dresden dojo would like to thank the organizing team of the DAV, as well as Datu Shishir and GM Bambit for this intructive weekend. 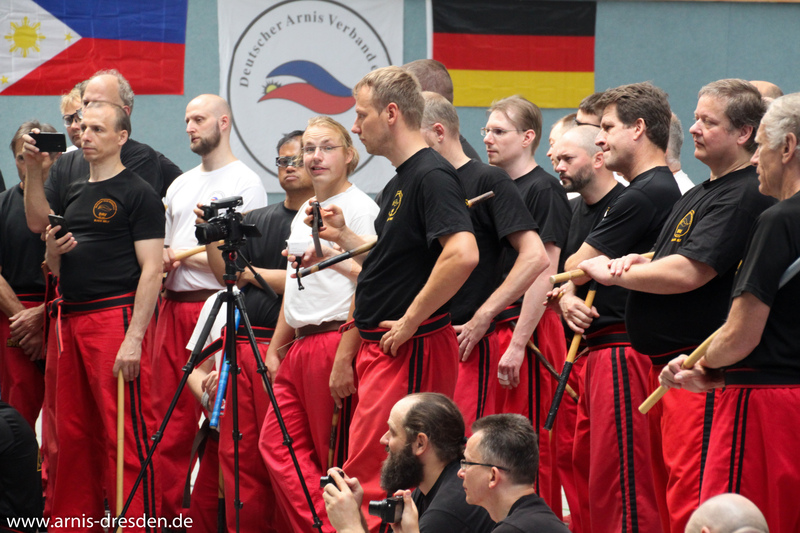 We loved it and look forward to the next meeting of the ARNIS FAMILY!